It’s to be expected that each of Bill Belichick’s players are told to simply “do their job”. The phrase “Do Your Job” is basically the approach of being prepared to execute the assignments given to a player. It’s a team-first philosophy where the whole is greater than the sum of its parts. This is why players like Malcolm Butler, Chris Hogan, Dion Lewis, and others are able to be inserted into the lineup and produce at such a high level season after season. 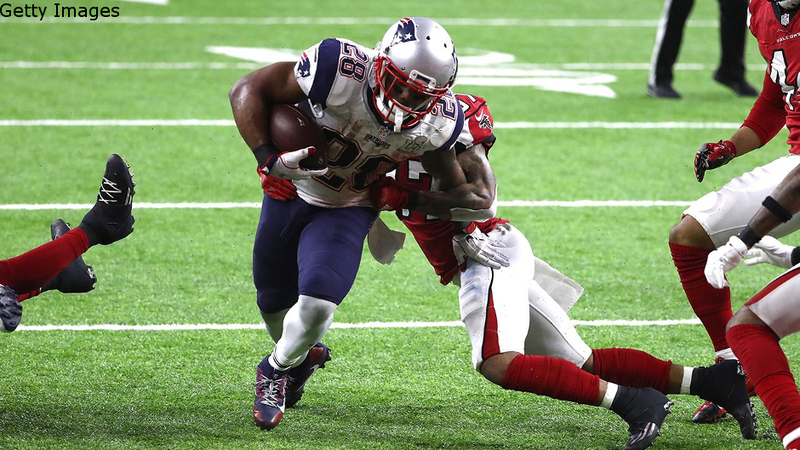 Arguably, no one encapsulated the “Do Your Job” approach more than receiving back James White in Super Bowl LI. The Patriots running back committee divides snaps based off of the defense they’re facing that given Sunday. Belichick and his staff believed that White provided them with the best matchup versus the Atlanta Falcons. Rightfully so, as White scored three touchdowns while amassing 139 total yards. A majority of the yards came on his 14 receptions for 110 yards. White also accounted for some crucial plays, including a two-point conversion to make it a one score game, the game-tying touchdown, and the game-winning touchdown in overtime. Late in the second quarter, with 1:37 left in the half, the Patriots were down 21-0 on their own 43-yard line with two timeouts remaining. On 1st and 10, New England was in 11 offensive personnel with wide receivers Chris Hogan (#15) and Danny Amendola (#80) to the right, and tight end Martellus Bennett (#88) and WR Julian Edelman (#11) to the left with White (#28) in the backfield next to Tom Brady (#12) in the shotgun. The Falcons cornerbacks all look to be playing press man coverage. When the ball is snapped the Falcons play man against the Patriots receivers as they run their routes with two safeties playing deep. 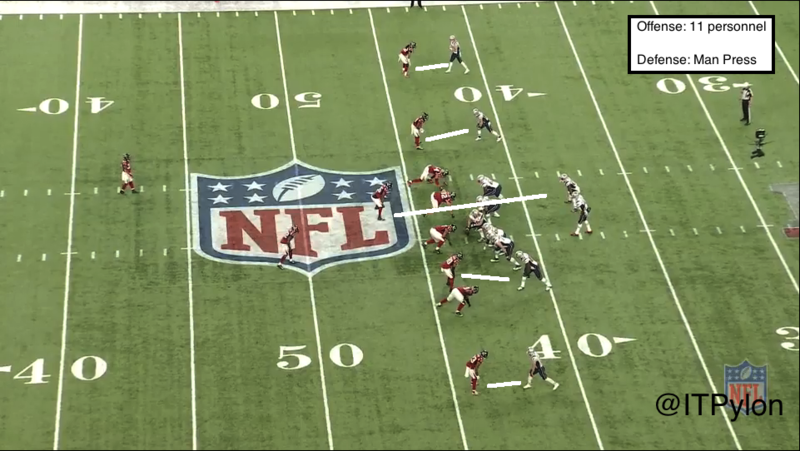 Brady runs through his progressions, but all his receivers are well covered by the Falcons secondary. New England struggled with the Falcons high ratio of man-to-man coverage early in the game. This was more than the Patriots expected as Belichick said in his Monday Super Bowl press conference, “You gotta lot of man on man coverage with an extra defender inside. None of those were unexpected, but that the percentages of them were higher.” The Falcons were physical and fast enough to play this style of defense against the Patriots for most of the game. With no one open downfield, Brady decides to throw to White in the flat. The pass is delivered perfectly as the defender, LB Deion Jones (#45), is sold that White is running his route up the field. 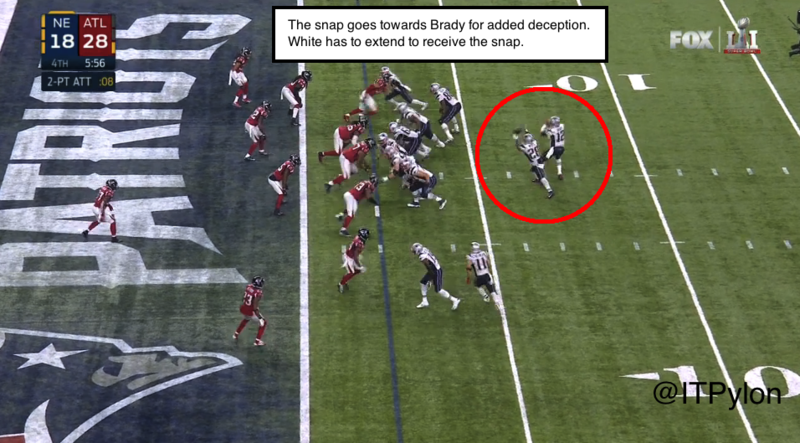 Instead, Brady throws the pass behind White who adjusts, makes the catch, and turns upfield quickly for a 28-yard gain. This play put New England in field goal range and the drive ended in three much-needed points before the half. After Amendola scored a 6-yard touchdown with 6:00 remaining in the fourth quarter to make the score 28-18 Falcons, the Patriots needed to go for two to make it a one possession game. The play Josh McDaniels calls here works to perfection. New England sends out 11 personnel with an empty backfield. White is lined up out wide to the right before Brady motions him into the backfield to his left. Brady then motions Edelman to the inside of the formation so the wide receiver can get a running start into his block. Brady fakes like the snap went high as White receives the ball directly. The Patriots’ offensive line then bulldozes a nice path for White to run through up the middle. Center David Andrews (#60) and left guard Joe Thuney (#62) combo block the defensive 1 technique, Grady Jarrett (#97), while right guard Shaq Mason (#69) and right tackle Marcus Cannon (#61) do the same to the 3 technique, Jonathan Babineaux (#95). When the next wave of defenders crash in, it’s Andrews and Mason who work up to the next level to clear space for White to score. An additional deceptive element of this play is how White receives the snap. This isn’t snapped towards White, it’s actually snapped to Brady. White has to extend his arms to his right to catch the snap. That’s without tipping his hand the snap is going to him in the first place. Overall, an impressive play call and execution by everyone involved. White had the ball in his hands on the last three plays of the Patriots’ game-tying drive in the fourth quarter. In particular, on 1st and Goal from the 7-yard line the Patriots were in 11 personnel with the running back alongside Brady in the shotgun. When the ball is snapped White runs a stab route, similar to the last play, where he runs to the open space in front of him. Brady quickly gets the ball to White who secures the ball while being hit by Jones. White displays his toughness by hanging onto the ball as he reaches the 1-yard line. On the next play White would rush for what was eventually the game-tying touchdown. It speaks to how Belichick, offensive coordinator Josh McDaniels, and the Patriots operate when White, a running back who hadn’t rushed for a touchdown all season, scores two critical rushing touchdowns in the Super Bowl as well as a two-point conversion. White executed his assignments and did his job on Super Bowl Sunday. And he did it well. Check out more of Joseph’s work here, including a look at Scott Linehan and the Dallas Cowboys’ Jet Sweep Screen, the offense Doug Pederson will run with the Philadelphia Eagles, and the Dak Prescott’s unappreciated skill.